Semper Augustus, the king of Tulipmania broken tulips. I have always loved Spring flowers. Few things are better than early Spring bulbs. Flower arranging is one of my favorite hobbies, and I take it quite seriously. However, after reading Anna Pavord’s book The Tulip, an obsession was born. I had thought about breeding flowers before, but never looked into the beautiful old varieties and true broken tulips. Due to the historic economic value of tulips, varieties are well documented. But what really got me was knowing that “broken” tulips still exist, and can be possessed. For those who don’t know, during Tulipmania certain bulbs developed amazing irregular colors and became very valuable. It was discovered much later that the bulbs had Tulip Breaking Virus. (Interestingly, Tulips are the only thing made substantially more valuable by being diseased.) This weakens the bulbs and slows reproduction, and the lines often go extinct. This limited supply was part of the reason broken bulbs became so valuable. Reading “The Tulip” I naturally became inspired to do more research on available tulips. I found that Old House Gardens is the only dedicated heirloom bulb supplier in the country. They have bulbs of all varieties, and I want them all. However, the tulip remains the king, and has a diversity and beauty no other flowers come close to matching. Many of the bulbs are near commercially extinct. I found out that they carry broken bulbs, one of which is a real Tulipmania tulip. 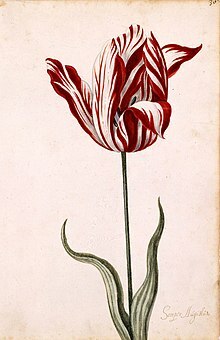 For some reason the disease has mostly stayed benign in these varieties of tulip, and they have lasted hundreds of years. Philippe De Comines, 1891. I will likely use something like this for my breeder bulb. Photo courtesy Old House Gardens. Modern tulips may look broken, but they do not carry the virus, nor do they have the intricacy. As far as I know, no one has tried to break a tulip and make it commercially available in at least 100 years. The nearest is around 80 years old, and was found on accident. Growers, in general, do everything they can to avoid the virus, which can cause significant economic value. Thus, I have determined, as a long-term life goal, not only to develop a wonderful collection of heirloom tulips and other bulbs, but to painstakingly break my own tulip. This tulip will be named the “Empress Alexis”, as a testament to my wife’s beauty which will outlive either of us. This is a very slow process, and one which relies on much luck and persistence. Fortunately, I am but a young man, and have hopefully 50 years to dedicate to this pursuit. Insulinde, 1921. A true broken tulip. Photo courtesy of Old House Gardens. Some newer tulips are break resistant, so I will need to buy heirloom “breeder bulbs”, on top of my beautiful broken tulips. It is recommended to keep the broken tulips away from your other tulips, but I would be excited to see anything break. Further, the main other flower it will damage is lilies, which I am not particularly partial to because they are poisonous to cats and I won’t bring them inside in arrangements. The disease vector for tulip breaking virus is peach aphids, which is fortunate because I already wanted to put a peach tree on my small hugelkultur bed. I will probably even bring in my own peach aphids, which shows how crazy I am! Jules Favres, 1913. An extremely rare brown tulip I had to buy because only 25 were commercially available nationally in 2017! Photo courtesy of Old House Gardens. This will be an expensive pursuit, as normal tulips are around $10 a dozen, and some of these rare bulbs cost more than $10 each. However, in my mind it’s a small price to pay for beauty and history! Another exciting aspect is that Old House Gardens buys from very small producers, so if I ever get a small farm I can raise rare tulips commercially!